A statewide quality rating and improvement system. Step Up to Quality is a statewide quality rating and improvement system that awards rating to early care and education programs that achieve increasingly higher standards. Step Up to Quality has been expanded from three to five levels and has been revised to include family and community engagement and health promotion standards. High-quality early care and education. Programs must meet specific benchmark indicators at each step before proceeding to the next step, with a star five rating being the highest level to achieve. Yearly on site-visits from a licensing specialist are completed to monitor that all indicators are being met. 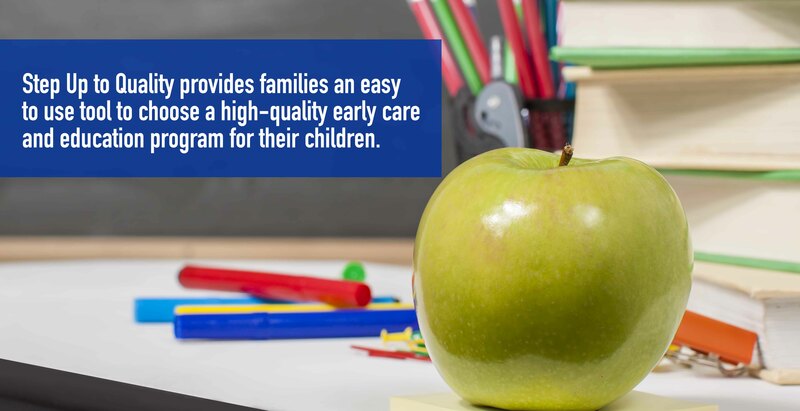 Step Up to Quality provides families an easy to use tool to choose a high-quality early care and education program for their children.